Save up to 23%, why not try? 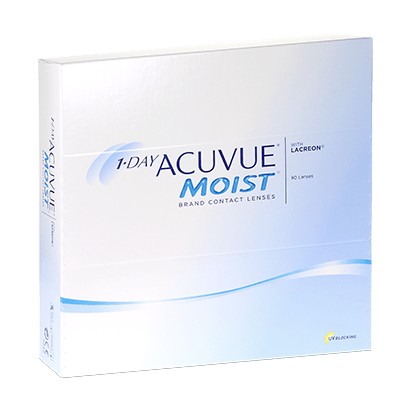 1 Day Acuvue Moist (90 Pack) are an excellent choice amongst our popular daily disposable lenses, ideal for contact lens wearers with dry or sensitive eyes. With the exclusive use of LACREON® technology, the 1 Day Acuvue Moist 90 Pack offers long-lasting comfort, as the PVP wetting agent is locked in to ensure the lenses stay hydrated from morning till night. Designed to block UV radiation, these contact lenses keep your eyes both healthy and safe for everyday use. Manufacturers Johnson & Johnson have found high level of satisfaction with the handling of 1 Day Acuvue Moist 90. The outstanding INFINITY EDGE™ design and silky coating of the contact lenses offers seamless comfort to the eyes. In addition, there’s no cleaning or storage necessary with these lenses as they are daily disposables, which can be disposed of at the end of the day, with a fresh new pair to be applied the next day. 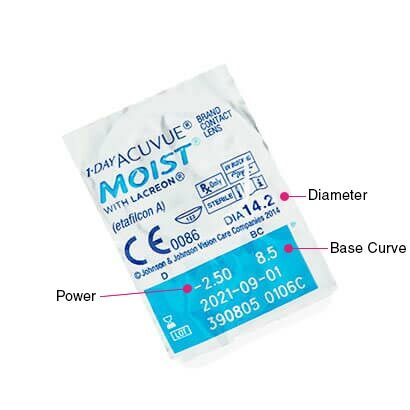 This pack size contains 90 lenses, while we also offer a 30-pack, as well as 1 Day Acuvue Moist for Astigmatism and 1 Day Acuvue Moist Multifocal. comfi Pure 1 Day can alternatively be worn as an upgrade. Definitely the most comfortable lenses and I''ve tried a few different brands. 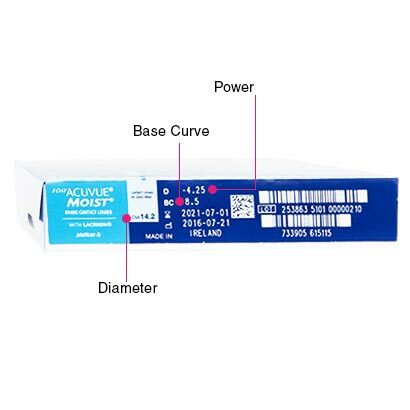 The Acuvue Moist Daily Lenses are the only lenses that suit my eyes. My eyes are very sensitive. Even though I would benefit (vision wise), with special lenses for a stigma in one of my eyes, I have been unable to use these sort of lenses because they are too thick and cause me discomfort. Acuvue Daily Moist are the only lenses for me. Easy to order and speedy delivery. Cheapest on internet! Keep up the good work, I am very satisfied with your services and the quality of my lenses. Shipment came exactly as ordered- daily acute lenses. Good trusted product - just delivery that is annoying. I have received the lenses. Very happy with the quick delivery, only upset about the treat you offer, it would be nice if you could provide a gelatine free product for the vegetarian customers. These lenses are very good especially if you have dry eyes. Very good product excellant service. Came within 24hours, on time and perfect ! what more could you ask for ! Order stated 3 months supply, however I don’t think that 3 months supply for only one eye counts. Have used acuvue for years, easy and comfortable to wear. I have been using these for few years now and must say they are the best contact lenses for my requirements. They don''t feel dry even if worn for longer periods of time. I tend to wear them for up to 5 days/week. Despite being pricey than some alternative products on teh market, they are worth the extra money. I have used these lenses for as long as I can remember! Never had an issue with them. Great product. A brilliant company to shop from. Excellent customer service, and delivery was the next working day. Quick and easy transaction from start to finish. Highly recommended. Great service and quick delivery. Good value. Highly recommend. Perfect product. Very happy with this product. Excellent contacts and good price. the multipack is very convenient, lenses itself are very good quality. They suit me very well. If you find some lenses are a little uncomfortable then these may be worth a try. Good product especially for dry eyes. This product works for me as I found the best to wear through the day and a 3 month option takes the hassle out of running out in a month! Excellent, quick service. Good price. Comfortable. Well packaged. What else can you say? Comfortable lenses which I can keep in all day. delivered on time. need to make sure you get the right price as different website sites have varying prices. Comfortable, daily lenses that have a UV protection. Lenses arrived the next day, highly recommended! Comfortable and competitively priced, I have used this brand of one-day contact lenses for some years now. In my opinion, they are just about the best disposable lenses you can get. Good quality reliable lenses. I have tried several brands but always return to Acuvue moist. Comfortable, thin, good value, easy to order. I would recommend them. I do love Acuvue contact lenses however after purchasing these, after a couple of hours they start rolling around in my eye. For long wear it doesn''t suit my eyes. However everyone has different eye types. What doesn''t work for one may work for another. Bargain if you use daily contacts and the 90 pack is more economical. No brainer really. The most comfortable lenses I''ve ever worn. Good comfortable lens. Would recommend this product. Always buy these as a perfect comfortable fit that lasts all day. Very comfy contact lenses. Staying moist all day. Better value for money than buying individual packs - always my go to with the big packs. Good lenses. Still get dry eyes occasionally which can make the lenses a bit uncomfortable but generally these are very good and gentle lenses for my sensitive eyes. Excellent value saved more than 50% on local opticians price for identical product! Great contacts for daily use. feel comfortable to wear and have never had any problems with them. Very good to go for this 90 pack as is usually a bit cheaper than the the single packs even if they have deals on. Very good product been using for over 10 years now and I don''t think I will switch as I find my eyes get quite dry with other brands. Simple and effective. Well packaged. I''ve found these lenses to be both very comfortable and easy to insert. Would definitely purchase again. Have been using these for more than 2 years. Works well with my eyes. Very easy online order. Very competitive prices and also extremely fast service. Amazing contact lenses, specially for dry eyes! Great service. Good price. Great thanks! Great lenses, my eyes never feel dry at the end of a full day wearing them. good product. Recommend to everyone. Much cheaper than other website worth to buy it again. I have purchased these lenses before but feel good did it cheaper and faster than anyone else. Very good lens. I wear the lenses longer than I should but this lens helps me with this. Good every day contact lens but am careful not to wear too long as dry eyes can be a problem. Great service and great turn around ??? ?Keep up the great work ???? Great lenses, I wear them for long hours of the day ( I know I shouldn''t), I''m self employed and they really keep my eyes fresh. I''ve been reordering my contact lenses with Feel Good Contact Lenses for many years now and it has always been a quick, easy and positive experience. That is why I will continue to order my contact lenses with them and can only recommend others to do the same! Good quality and very comfortable contact lenses. The best contact lenses I''ve ever used - don''t dry my eyes out! Lenses delivered 2 days after ordering. Excellent service. I''ve been using this product for over 6 years and it''s great, smooth and sits well on the eye. I''ve played around with other contacts. These keep my eyes moist all day. Absolutely amazing and trustworthy service. Cheaper than the opticians, same quality of lenses plus reminders when you''re running low and free next day delivery with my 90 pack! Fantastic. Long time user, best for dry eyes. Comfortable to wear, haven''t had a dud one yet! These are very comfortable lenses that are packaged well. Much better than previous lenses I have tried. Very happy with the service. Fast shipment, competitive prices! Recommended! My eyes get dry quickly but I find these lenses soft, moist & easy to wear all day. A very reliable and comfortable lens that''s easy to put in. I often wear mine for 10-12 hours at a go and I''m barely even aware that I''ve got them in. Used this product for many years and think they are great! I hunted around for the best price, and went for Feel Good. Also received the best service. Excellent product comfortable to wear reasonably priced recommend to all contact lens wearers . I like these lenses. I can leave them in longer because they dont dry my eyes out. I dk however sometimes have a problem putting them in. They are so moist I blink and they slide out. A very straightforward ordering process with a very quick delivery time. I can''t fault them in any way. Very reliable and efficient service. Very Comfortable lenses . Lasts whole day. Good value, excellent product, good for dry eyes. I''ve never had an issue with these lenses. Been using them for years and wear them up to 12 hours without getting dry eyes or irritation. Good contacts although occasionally eyes become dry wearing them. Have been using these lenses for over a year. Perfect for those who suffer with dry eyes like I do. Had been paying £39 for 30 days supply from my optician so I am delighted that I can now save around £15 a month by purchasing the 90 day pack from Feel Good Contact Lenses. My eyes tend to get very dry - I work in an office with all-day air conditioning and am staring at the computer monitors the entire time. Acuvue Trueye did not work for me so switched to these, which are great for me.